Serve healthy, home-cooked meals to your family every week, with a little help from us. Each week we offer a meal package prepared with locally sourced, high-quality ingredients. Simply order, heat and enjoy! Every week, we prepare a limited quantity of grab and go meals. Be sure to place your order early. No substitutions in dishes allowed. You may order a single item or multiples of items. Orders close the Friday before your pickup week. Pickup days are typically Tuesday afternoons, but may change certain weeks due to holidays. Homemade chicken noodle soup just like mom used to make. Fresh chicken, sautéed veggies and homemade chicken stock. Good for a weeknight meal, lunches, or to keep in the freezer! Lean ground turkey with our homemade taco seasoning. This kit also comes with fresh tomato salsa and fresh guacamole. Click “Register Now” to order! Think outside the box for your next team building or corporate event! Engage clients and get to know your fellow team members in a new and FUN environment. 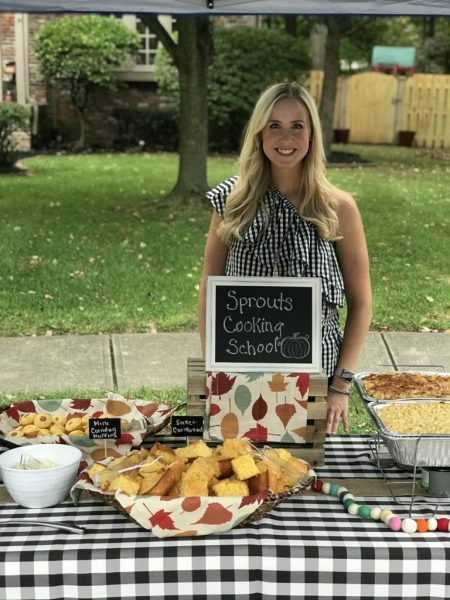 Sprouts can create a custom menu and class just for your event. Our most popular request is a Chopped style class where team members will have to cook off against one another. Talk about a great event for team building and definitely an event your clients will remember! If you have questions about your private event, please contact us!